Made with organic bamboo fibre. The cup can be washed in a dishwasher but it should not be placed in a microwave. It has a resealable non drip lid. 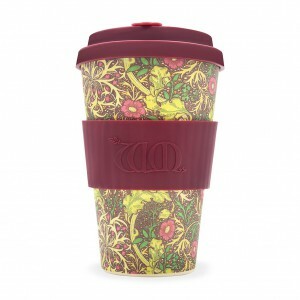 Using this will help to reduce the impact of single use coffee cups and it is so fitting to have an ecoffee cup designed by William Morris as he was a supporter of environmental principles in the Victorian era: well ahead of his time.